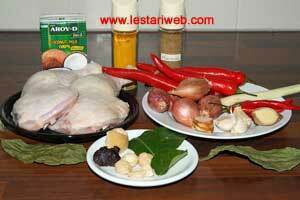 There are many varieties of Indonesian poultry dishes. 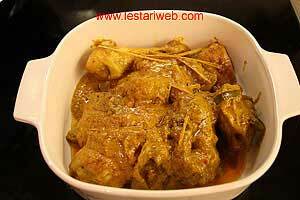 A famous variant among them is "Ayam Bumbu Rujak" and "Ayam Panggang Bumbu Rujak" which's originated in Java island. With this recipe you can provide two diferrent menus. The ingredients are simply the same only the cooking process is little bit different. If you like to eat it as a soup then you can stop the cooking somewhat earlier. 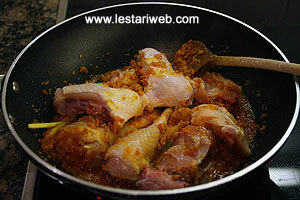 At this stage you will be served with "Ayam Bumbu Rujak". 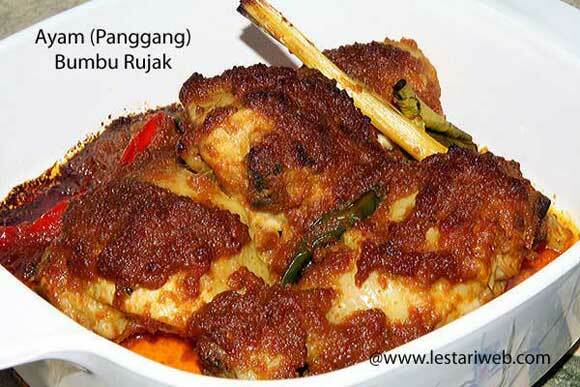 But if you still have more passion and are intrigued by this indonesian chicken dish with it's exotic sauce then I will recommend you to try "Ayam Panggang Bumbu Rujak". Though it needs more time to complete, it's really worth trying for!!! If you don't like it spicy, just take away the small chillies from the list. Don't worry....It still taste best!! If preferred you can add more spice for the paste as you desired. For example making it double for the same weight of chicken. The more spices for the paste you add, the tastier it will be ! 2 chickenbreast (weighing about 600 gr / 1.5 lb), washed. 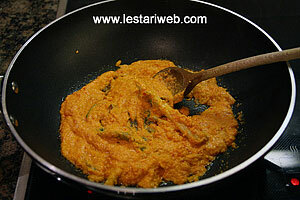 For the Mixed Spicy Chicken: Put all ingredients for the paste in a blender or food processor and blend until smooth. (If necessery add a little bit oil to help the blending process). Stir fry the paste, lemon grass, galangale, kaffir-lime leaf and bay leaf. Stirring all the time until well cooked & fragrant. Add the chickenbreast and stir to mix. Cook until the chicken becomes harder and it's colour turns to white. 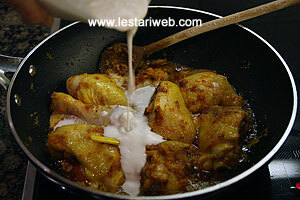 Pour in the coconut milk, add the tamarind water and bring to boil on a maximum heat. Stir occationally. Adjust the heat into medium and simmer until the chicken well cooked. If you like to eat it as a soup or "Mixed Spicy Chicken", then you can stop the cooking now unless otherwise. 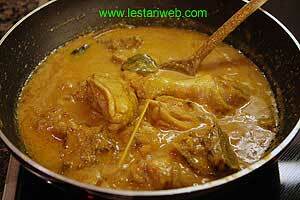 For the Roasted Spicy Chicken: Continue to simmer untill the coconut milk is driven off and the chicken has become brown and almost dry. At this stage you will probably need to stir all the time to prevent burning. Meanwhile preheat oven to 350°F (180°C). Transfer the chicken in a Pyrex Glass and pour the thick sauce over it. Bake the chicken for about 15 - 20 minutes. Now your "Roasted Spicy Chicken" is ready. Serve hot with rice or potato.